Back in about 2003, when I bought my first tuba (after college = no more school tuba), I considered a 2341. IIRC, there was a batch at BBC being sold, new, for $3,000 each, with the disclaimer "you will never see these prices again." Guess that was true! Frankly, I think the low price scared me off a bit, too. Plus, I was already a CC person by that point. At one point, I had 6 tubas. Then I downsized. The one I kept is a 2341 (new model - 2nd iteration). Those with better ears than mine claim it's "one of the good ones". Which is a clue - some are very, very good - others are not. Play test before buying. Otherwise - it was "tuned at the factory" and does effortlessly everything I have ever needed it to do. sloan wrote: it was "tuned at the factory" and does effortlessly everything I have ever needed it to do. I’m a bit envious of having six tubas,but I’ve certainly had my share over the years. I’d like to find a medium sized BBb or CC (King 2341, Eastman 632, etc) that was easy to play, easy to hold, and had very easy intonation. But then again, there are a bunch of tubas I’d love to own. Donn wrote: Did all of these glowing testimonials apply equally to the Old Model, and/or 1241? My guess, just on principle, would be that they're physical similar enough that differences are going to be as much due to assembly line accidents - but they will be different to the player because of the old model's tall bell. "old" versions" (both 1241 and 2341) play just as well. Well-cared-for older ones seem to have been considerably more carefully constructed, but what else is new? BTW, I can even use this with my helicon, splitting the load evenly over both shoulders; this was a game-changer for both horns and highly suggest it for all players. Little late to the party but my comeback horn was a new 2341. Then life happened and I sold it. When it was time to buy another horn I had every intention of getting another 2341. However I came across a great deal on a Miraphone 289 and couldn't pass it up. I loved everything about the King I had. Maybe mine was an exception but the fit and finish was perfect. Other than the water collection that is common to these horns I would buy another one in a heart beat. And I still keep my eye out for a well taken care of used one. A good 2314 is a joy to play - and Matt is the guy to help you find a good one. I’m convinced that they are ALL good, once Matt has prepped them. As for spit valves, I always pull the top slides and pour. It helps to remind me to keep them free sliding (although I never pull a slide while playing - a combination of my tin ear and the fact that they are “tuned at the factory”. I recently had to downsize. 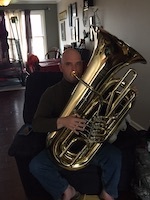 I kept ONE tuba - the 2314. It can do almost anything “adequately” - and I specialize in “adequate”. i really like my 2341. i haven't played all that many tubas the last 30 years, i've been teaching high school band and played about everything BUT tuba. of the few horns i have played, i like mine as well or better. i had the valves vented, another spit valve on the 4th valve slide, the removable slide/valve section was made permanent with extra bracing, and the lead pipe is braced to the bell now. i've kept the metal valve guides so far, but they're clicking a little now... i think i'm going to have them worked on. my guy tells me they wear and he will custom fit new ones to make them quieter. i had the first valve done that way already because it was so noisy and it's made the other 3 stand out now. i have another instrument coming (a 3/4) and when it gets here, i'm going to send the king up for a full valve guide job. the weight is the only negative for me. my doctor calls what i have - erosive arthritis/degenerative disk disease. the 2341 in it's original case is about 50 lbs. i'm strong enough to lift that fine... but my joints/back don't like it and make me pay in pain later. i use a gig bag and a cart. no problem holding it up to play though. it balances fine.